Cook bacon in large skillet over medium heat until crisp. Remove bacon from skillet; drain on paper towels. Refrigerate until needed. Reserve bacon drippings in skillet. 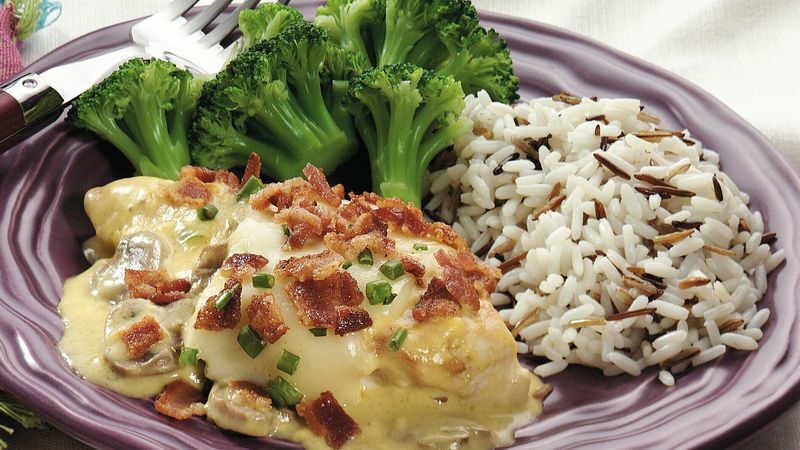 Add chicken breast halves to bacon drippings in skillet; cook over medium-high heat for 3 to 5 minutes or until lightly browned, turning once. Transfer chicken to 4- to 6-quart slow cooker. Top with mushrooms. In same skillet, stir together soup and sherry. Spoon over mushrooms. Cover; cook on low setting for 3 to 4 hours. Top mixture in slow cooker with cheese slices. Sprinkle with chives. Crumble bacon over cheese. Increase heat setting to high; cover and cook an additional 10 to 15 minutes or until cheese is melted. Meanwhile, microwave broccoli in covered microwave-safe dish on HIGH for 6 to 8 minutes or until crisp-tender. With slotted spoon, remove chicken, broccoli and mushrooms from slow cooker; arrange on serving platter. Serve with cooking juices from slow cooker. Most recipes don't use chicken breasts for long, slow cooking because they can become dry and stringy. In this recipe, however, the chicken stays moist and tender because it is smothered with a creamy sauce and simmered just 3 to 4 hours.